Guinea Pig vs Rabbit - Which Makes The Best Pet? Home Guinea Pigs Guinea Pig vs Rabbit – Which Makes The Best Pet? Plenty of potential pet owners are on the fence over the pros and cons of owning a guinea pig vs rabbit. Each is an adorable small domestic animal with tons of positives and a few drawbacks, depending on what qualities you’re looking for in a pet. 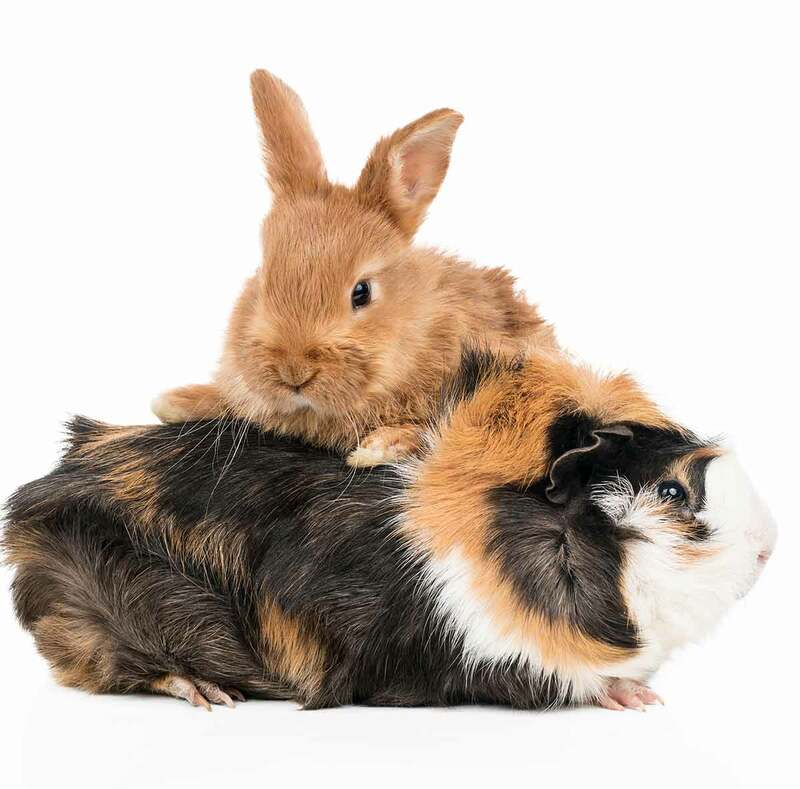 We’re going to take the guesswork out of the “Should I get a rabbit or guinea pig?” conundrum by looking at each animal’s basic needs and temperament. You’ll find that either pet makes a favorable companion depending on your own requirements and expectations. 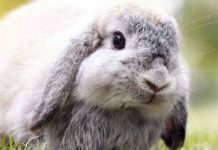 Along the way we’ll explore whether a rabbit or guinea pig for kids is the more suitable option, as well as considerations such as space requirements and companionship needs. Guinea pigs and rabbits share a lot of common needs. As small herbivores they have similar diets, and use similar cages and bedding. Rabbits, however, need much more space, and are more likely to bite. Guinea pigs are more fragile and do not react well to rough handling. So which one makes a better pet – rabbit or guinea pig? Let’s find out! It’s a common misconception that rabbits and guineas are low maintenance pets. Each has daily needs such as a specific diet (including fresh food and water), routine cleaning of their living quarters, and daily play time away from their enclosures. 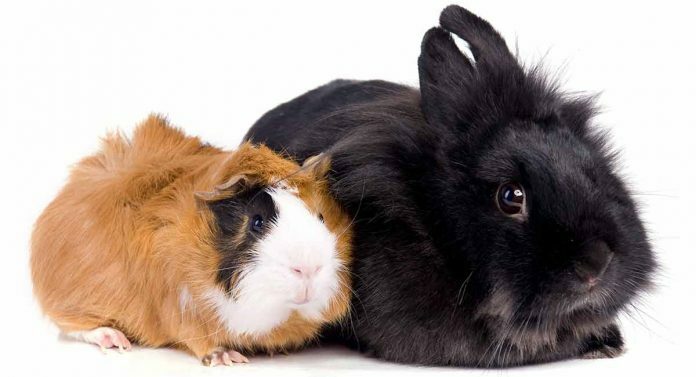 While guinea pigs and rabbits share several traits in common, they have a few significant differences. For starters, pet parents of all ages will find well-socialized guinea pigs and rabbits to be responsive and entertaining animals. Early socialization is key to raising a well-adjusted and non-aggressive animal that isn’t overly timid. This involves frequent, gentle handling of either your guinea pig or rabbit, and exposing her to many different people and situations. In general guinea pigs, also known as cavies, are social animals and need to live as part of a group of at least two. Overall you will find rabbits to have a calm and friendly demeanor, but keep in mind that they require quite a bit more space than cavies. Let’s delve into the wonderful world of guinea pigs vs rabbits as pets, by taking a quick look at their vitals! Guineas are rodents that range from around 8-11 inches long and typically weigh between 1.5 and 2.5 lbs. Cavies can live up to 5 or more years with proper care. Feeding a guinea pig is not an expensive proposition. They are herbivores and should be given limited amounts of fresh vegetables and fruits along with a high-quality guinea pig food and unlimited amounts of timothy hay. Guinea pig teeth grow continuously, making various hard chew toys and snacks an absolute necessity. Unlike guinea pigs, rabbits encompass a much larger range of sizes, from small pygmy rabbits who are around 8 inches long, to larger species which can reach 20 inches and weigh more than 10 pounds. Rabbits typically live an average of 8-12 years. Like cavies, rabbit are herbivores, which means they do not eat meat. They will thrive on a produce-based diet that includes grasses, unlimited amounts of timothy hay, and certain veg and fruit. Like the guinea pig, rabbits have teeth that never stop growing and must have the proper toys and food to munch to keep their pearly whites manageable. What is the difference between a dwarf rabbit vs guinea pig? Size matters in this equation, with dwarf rabbits averaging 1 to 3 pounds! This makes dwarf rabbits comparable in size to guinea pigs. Age is an important factor to consider when bringing home any type of pet. 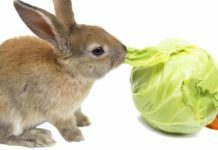 Is a rabbit or guinea pig for toddlers or children an age-appropriate pet? First of all, children of all ages should always be supervised when handling, playing, and caring for either cavies or rabbits. Adults should be the primary caretaker, as both animals are small and delicate and require gentle handling. Guinea pigs are smaller and easier to handle. They are also less likely to bite. However, a rabbit’s larger size can make it easier for children to pet them and they tend to be more outgoing and confident – a useful trait around kids who sometimes make random movements and noises. Overall, we would probably give the edge to the guinea pigs for younger kids, but they can both be excellent pets with the right supervision. First domesticated as far back as 5000 B.C. in South America, guinea pigs are known for their unassuming natures. They can be quite affectionate and friendly when being handled. For their optimal well-being, they need to live in groups of two or more, but as guineas are very fertile separation of the sexes is a wise idea! This involves an excited jumping up and down. Watching groups of cavies popcorn together is quite an entertaining experience. In addition cavies are vocal little beings, with a wide range of squeaks and sounds emanating from their little bodies! Domesticated since the Middle Ages, it’s estimated that there are upwards of 1.5 million pet rabbits in the U.K. and more than 6 million in the U.S.
Pet rabbits have a reputation for being highly social. They are friendly with each other and other animals in general, and typically enjoy interacting with humans. Unlike cavies, rabbits are on the more quiet side! They are known as an intelligent little guys and gals, with some rabbits able to learn rudimentary tricks and respond to the sound of their names. Rabbits are descended from prey animals and they retain a certain alert nature to any perceived threats. In addition, rabbits can scare easily. When startled by loud noises or rough handling they may respond by biting or kicking. Conversely, guineas have a docile nature, are easily tamed, and rarely bite. According to the Humane Society of the United States (HSUS), a rabbit’s cage should be at least five times the size of the rabbit. Your bunny should be able to fully stretch out in his cage, and stand up on his hind legs without touching his head on top of the cage. Rabbits can be litterbox trained, and in this case be sure to provide extra space for the box! Because rabbits breed prolifically, either gender segregation or spaying/neutering are population control options. One guinea pig: a minimum of 7.5 square feet cage space; 30″ x 36″ is a good size. Two guinea pigs: a minimum of 7.5 square feet with 10.5 square feet preferred; 30″ x 50″ is a good size. Three guinea pigs: a minimum of 10.5 square feet with 13 square feet preferred; 30″ x 62″ is a good size. Four guinea pigs: a minimum of 13 square feet; 30″ x 76″ is a good size. Word to the wise: Unless you want guinea babies, it’s prudent to keep the sexes separated! 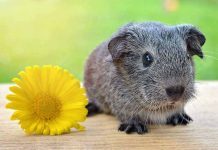 Guinea pigs have a slightly more sensitive internal system than rabbits do, and they don’t do well with humid conditions. Aim for around 65-75 degrees Fahrenheit as the ideal temperature range; guinea pigs do not sweat so they are susceptible to heat stroke. Rabbits like it even colder; 60-70 degrees Fahrenheit is ideal for them. They also prefer less humid conditions. Keep in mind that your pet’s enclosure will be a repository for toys, dishes, bedding, etc. Ideally, the more room you can provide your pet, the better. On the plus side, guinea cages can be stacked into varying levels, which makes the overall cage footprint smaller. But keep in mind that guinea pigs don’t climb! Both guinea pigs and rabbits can be relied upon to groom themselves. But brushing is a good time to check your animal for signs of disease or unwanted pests. Plus, it’s a great way to bond. Your guinea pig can be groomed with a soft-backed brush, while hairless guinea pigs can be rubbed with a bit of lotion to keep the skin soft. Guinea pig nails should be clipped about once a month. Rabbits require brushing when they are shedding, although regular brushing is good for the fur – not to mention fun for the owner! Whichever animal you choose to bring home, we hope that our guide has given you valuable insights on the topic of guinea pig vs rabbit! Royal Society for the Prevention of Cruelty to Animals, Rabbits. American Rabbit Breeders Association, Inc., Homepage. Humane Society of the United States, Rabbits. Humane Society of the United States, Guinea pigs. Grove Veterinary Group, Rabbit information.